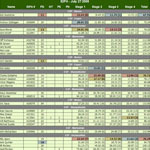 All of the Oceanside Practical Pistol Club match score sheets that are currently online can be accessed from this page. Select your match type from the list below to view matches of that type (steel, IDPA, IPSC, etc.). Scores are listed by date with the most recent scores at the top of the list. If you'd like to be notified whenever new scores are posted you can subscribe to our email list. If you notice any discrepancies please email scores@oceansidepistol.com so that we can get them corrected.